The first JX-series model we've seen from FujiFilm, the FinePix JX280 is an affordable compact digicam that is designed for those looking for an inexpensive camera for their family or teenagers. While the JX280 is light on your wallet, it's not light on features. With 14-megapixels, a 2.7-inch LCD, 720p HD video recording, and a 5x optical zoom with wide viewing angle, the JX280 is packed with appealing specifications. Designed with those in mind who want to simply point and shoot, the JX280 is loaded with user friendly exposure options, like SR (Scene Recognition) Auto, Tracking AF, and Face Detection with automatic red-eye removal. It even features a durable metal body, which is surprising when you consider it's price tag. 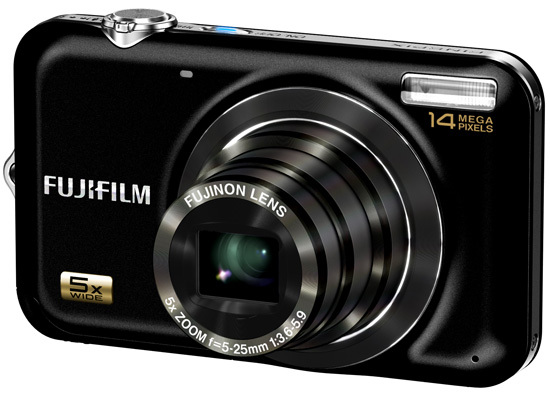 The FinePix JX280 will be available in late August for $149.95 US.